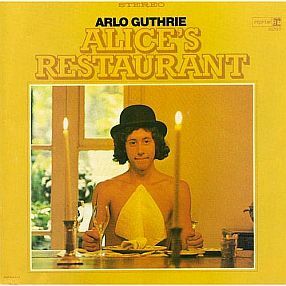 … is that you can get anything you want at Alice’s Restaurant, kid. Happy Thanksgiving and/or Hanukkah to thee and thine. And don’t forget to pick up the garbage. This entry was posted on November 28, 2013 at 7:19 am and is filed under Agitprop, Deep political thought, Holidays. You can follow any responses to this entry through the RSS 2.0 feed. You can leave a response, or trackback from your own site. Oh, Lordy! Thanks, Patrick. That certainly is a great way to start the day! Happy Thanksgiving to you and Herself, and everyone else who stops by the Virtual Pickle Barrel today. PS: Happy Thanksgiving to all. Already heared it on the electric radio macheen this morning as I whipped up brekkie. Happy whatever to you, yours, and everyone else! Good use for a church, feeding people in this life. A great turkey-day to all. We celebrated with some friends in Sicily who roasted a chicken since turkeys are hard-to-find. We brought the canned cranberry “sauce” so it was sorta like the real thing overall. Tonight it’ll be fresh seafood if we can score a table at our favorite place – the one where you sit down, choose your wine and then they start bringing the plates, each one a very tasty surprise as they depend on what the chef liked at the market that morning. That’s one difference between Italy and the USA, Larry. Over here, turkeys are never very hard to find…. Dunno, Khal, we have ol’ Mr. Bunga-bunga here, just kicked out of the italian Senate and reportedly claiming he now knows how the Jews felt under the Nazi regime. The ego on this turkey makes BigTex seem almost humble by comparison. BTW-the seafood dinner was excellent as usual, they even served swordfish pasta in between almost endless tasty antipasti and the roasted fish second plate. We staggered out of there VERY satisfied…and all for $50 a head, including vino, water, caffe, grappa, tax and tip! And people wonder why I want to live here?